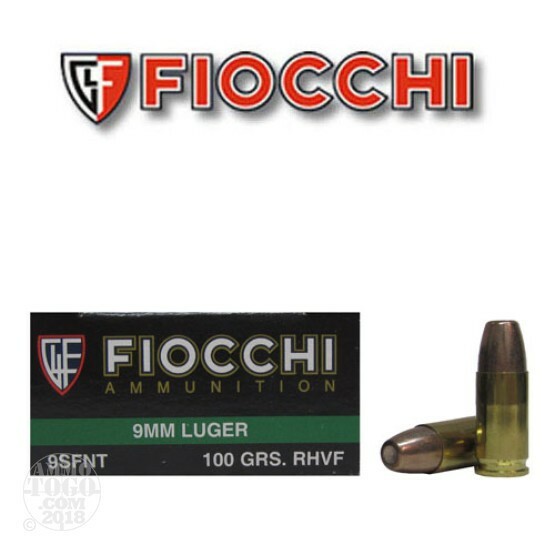 This is 9mm Fiocchi 100gr. Non-Toxic Lead Free Sinterfire Frangible Ammo. The frangible bullets these cartridges are loaded with are made from a lead-free metal powder manufactured by Sinterfire. Sinterfire is the leading manufacturer of frangible bullets. This ammo will fragment when it hits a hard target rather than ricochet. This ammo is ideal for ranges that require lead free ammo. This ammunition is new production, non-corrosive, in boxer primed, reloadable brass cases. This ammo is packed in 50rd boxes, 1000rds. per case. I have used Frangible ammo for years for steel plate targets. Typical copper jacketed lead ammo can splash fragments back even at the recommended 30 foot minimum distance specified by plate manufacturers. Frangible bullets disintegrate into fine grains like sand when striking the steel plates resulting in reduced hazard. These rounds have functioned in the M&P Shield, other full size 9MM pistols, and my carbine without problem and are quite accurate as well. The extra cost of Frangible over standard ammo is justified by increased safety when shooting steel. I had multiple failure to fires with what seemed a hard primer, also some extraction and ejection issues. In a Glock 34. About a 10% failure rate. Great ammo for doing malfunction drills. Had one round from first ten shot so far fail to fire. Primer ignition only. Other nine rounds cycled OK in Glock 17. Saving the rest for training class. Great ammo. Accurate. No failures in M&P 5" CORE that I used in a recent training class.